It’s been called the great migration of the 21st century as Generation Y moves from the suburbs to urban developments. They’re seeking smart designs, connectedness with their colleagues, better downtown vibes and to be within walking distance of all things important to them. They also want their high tech lifestyles – the latest smartphones, tablets, Wi-Fi, and huge, flat screen televisions at their fingertips. But Generation Y isn’t the only group moving into high-end downtown condos and apartments. A new wave of baby boomers are exchanging sprawling homes in the suburbs for the energy and life that urban living provides – without the hassles of endless chores. A recent Wall Street Journal article explored what it called a “gold rush” of older, moneyed buyers moving into condominium penthouses and luxury town homes. The common ground between these urban moves is smaller footprints. In New York, the average size of a 2-bed, 2-bath condo is around 850 square feet. In Seattle, the average size is around 647 square feet. Space is definitely a premium, but the benefits of living an urban lifestyle do not mean you have to give up on things that make your life more enjoyable. The makers of TVLiftCabinets.com find that many people come to them because wall space can be a problem in urban settings. Often the largest spaces are near or in front of windows, and they don’t want a television permanently mounted in front of their precious lighting source. They also don’t want to downsize their televisions – they’ve gotten used to high definition viewing and there’s no going back. 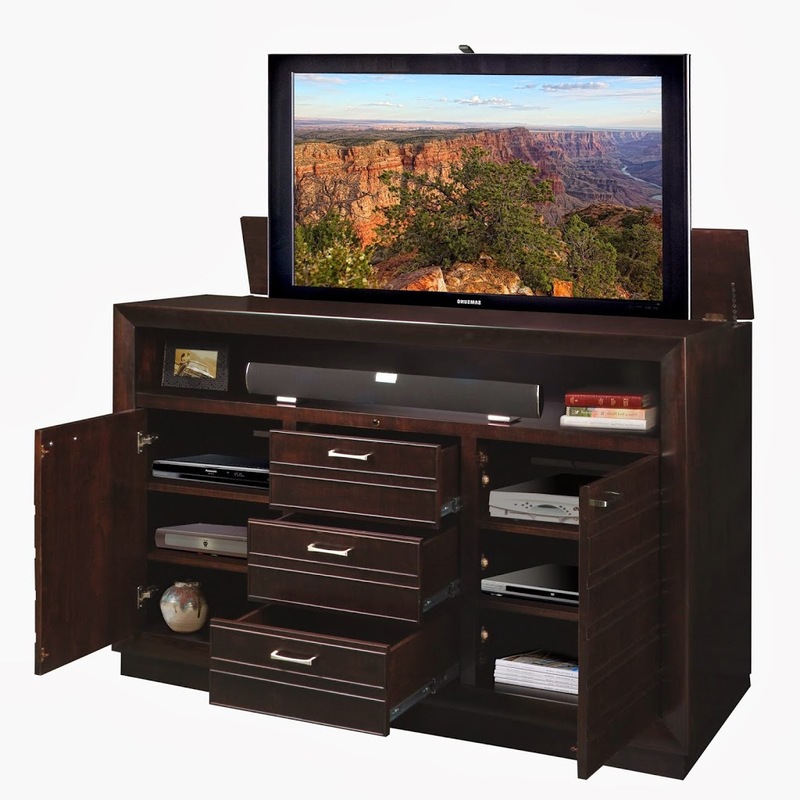 TVLiftCabinets.com offer the best of both worlds for people who want smart designs – Amish-crafted cabinetry when you’re not watching your favorite program and smart-lift technology that appears on command. One of the most popular contemporary styles is the Concord, offering tons of space-saving features for electronics, and drawers for storage.